Skytech offers complete “Tip to Tail” service and support through FAA Diamond Award-winning shops. With two FAA-certified repair stations and systems and processes that meet the stringent underwriting requirements for one of the world’s largest and most respected aviation insurers, Skytech is poised to meet the service needs of pilots of owner-flown and business aircraft throughout the Mid-Atlantic. Our service centers also provide access to Piper and Pilatus parts. You can count on Skytech to utilize the latest technology available to locate the best price and condition; shipped to you in the quickest delivery time available. 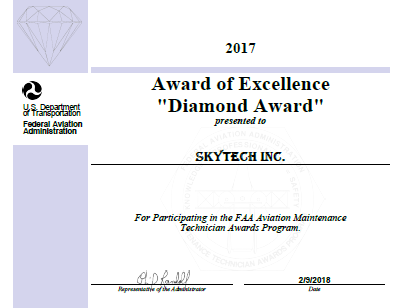 Skytech is a continuous recipient of the Federal Aviation Administration’s Award of Excellence “Diamond Award.” We continue to strive to go above and beyond what is required to bring our customers the best in the industry.